Nature gives signals… there are many times we ignore it but on that warm day of June it was hard to overlook them. As I was sipping a cup of tea in my camp in Corbett Tiger Reserve, a pair of white-backed vultures was displaying an extraordinary aerial combat. Moments later, a brown headed barbet perched itself on a tree next to me and was tossing small seeds and flower buds in the air as the food was landing straight in its mouth. As I was observing this pleasing moment, a crested serpent eagle flew and rested itself on a branch right over my head. I changed position to save my tea and saw that the magnificent raptor was feeding on a rat as the filtered sunrays were lighting up its fiery eyes. 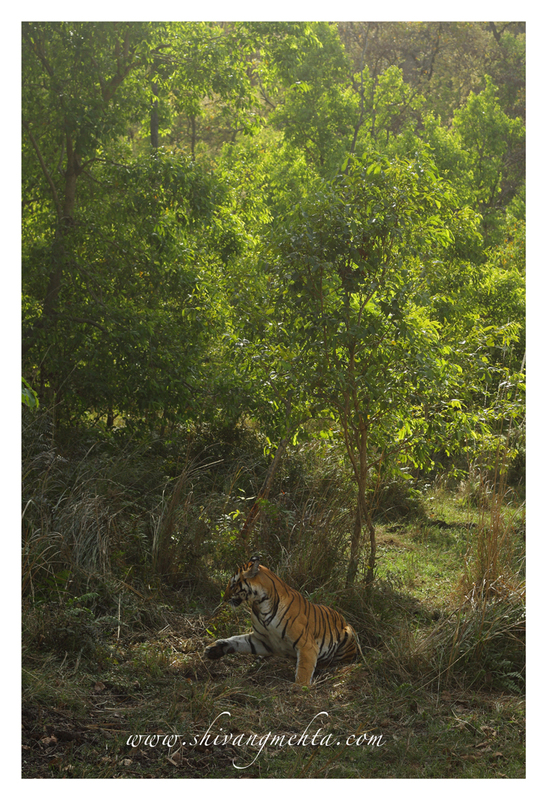 “Seems to be a lucky day,” I thought and headed off for a short drive in the buffer zone of Corbett Tiger Reserve. For years, I had dreamt of a close encounter with one of the most ferocious and supreme rulers of the forest. Not a tiger, not an elephant but a reptile that rules the waters of Corbett. A reptile that on any given day can even give a tiger a run for its money when it comes to power. These seemingly lazy monsters can surprise you with their agility and their powerful jaws can crush the heaviest of preys like Sambhars in split seconds. The mugger crocodiles and gharials have been ruling the sparkling waters of the Ramganga and can be frequently seen resting in the cosy banks of the river from various vantage points inside the national park. However, on multiple occasions, I tried my luck with them by visiting stretches of the Ramganga outside the national park. My attempts were to approach them carefully so as to get a close shot of these aquatic beauties. Most of these attempts failed as crocs are extremely sensitive to sound and they tend to disappear in the river with the slightest of disturbance. As I was heading towards Marchula crossing the dense saal cover, I was wondering if the luck I was enjoying since morning would favour me. Forest superstitions plague your mind at times. “If I sight a cheetal somewhere in the next 2 minutes, this is certainly my day,” I told myself. I had hardly made this statement when a slight movement on the road bend caught my attention. 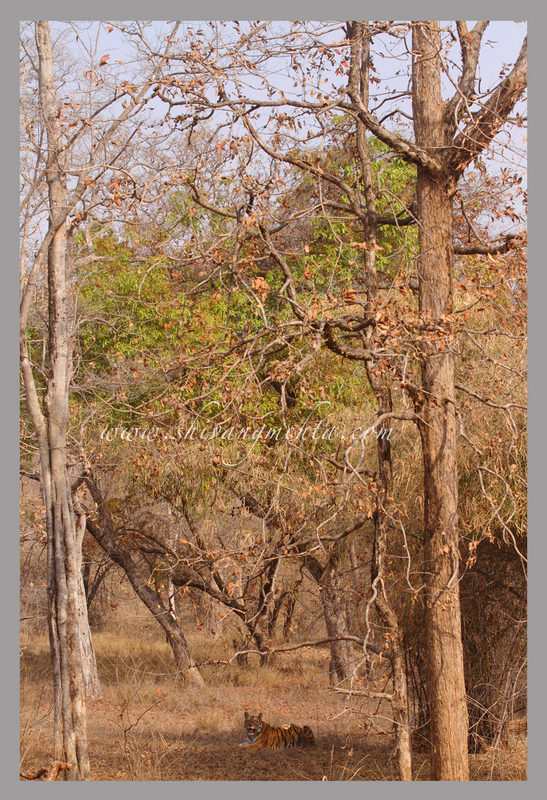 A full grown cheetal stag walked out on the road looked straight at my vehicle and sprinted towards the other side. I was thrilled and marvelled at the signals that nature was giving me. On reaching Marchula, I approached the river with anxiety and apprehensions. As I was descending from the hill, I saw something that seemed to be a log of wood. I inspected the area closely using my binoculars and the mighty jaws were wide open. 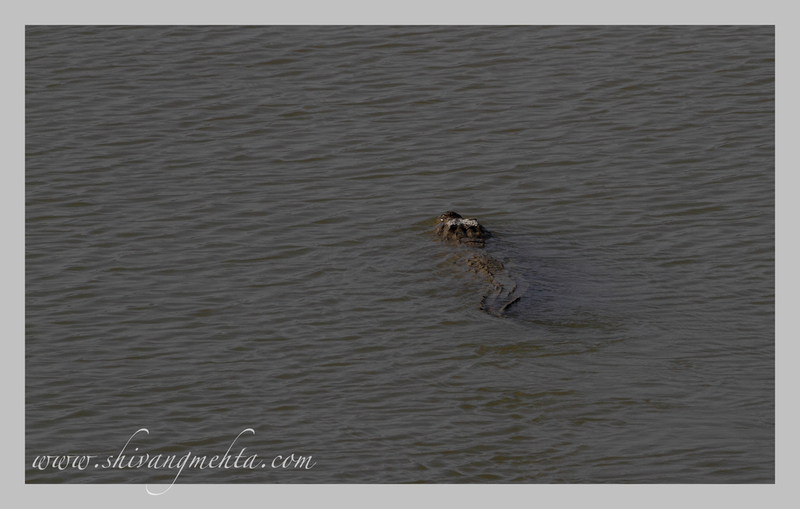 A giant mugger croc was lying on the bank of the river… and luckily the bank was the same area I was approaching. I noticed that the beast was almost 20 meters away from the river. 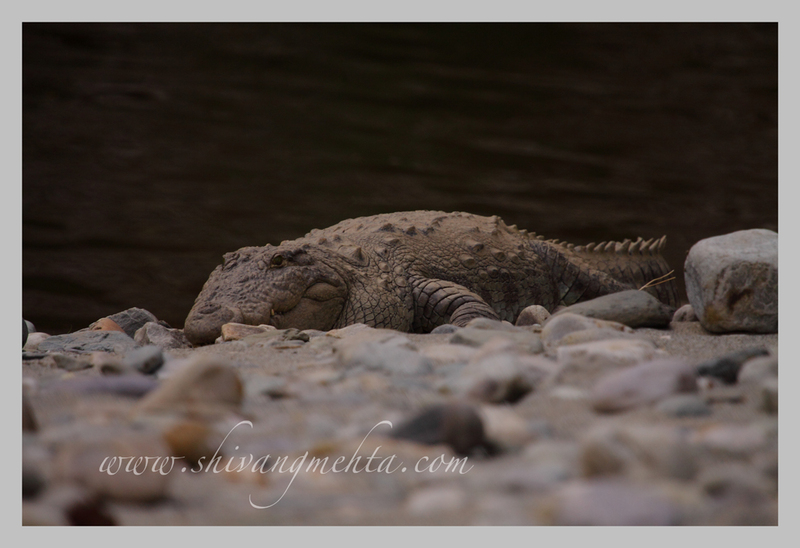 Today was the chance for be face to face the monster of Ramganga – was the though as the distance was reducing while I was approaching the croc with steady and soft steps ensuring that I do not make a single sound. The slightest movement from his side and I would stop and stay still till I felt that the animal was comfortable with my presence. I was now 20 meters away from the beautiful crocodile which was nearly of the same size as the distance I was maintaining. Sweat was dripping down my face and I could feel a cold shiver down my spine as those intoxicating green eyes were checking my every move. I don’t know whether it was because of fear or excitement… but I guess it was a mixture of feelings. The handsome croc with its fiery eyes had now started give me the most nerve chilling experience in the wild as it started advancing towards me. I guess nature was now signalling that the time had come for the retreat and I slowly started backing off leaving behind the croc in that pristine valley that draws me back every time in search of the river prince! It was my 18th consecutive drive in Bandhavgarh National Park. Excessive VIP pressure in the premier Tala zone of the park had disturbed my tiger cub hunting project which had started with a bang during the first half of my visit. The development unleashed the explorer in me as I spent considerable time exploring and discovering lesser tracked areas of Bandhavgarh. The satisfaction of emerging with first photographic records of unrecorded stripes in these areas was immense. The Easter weekend got the Nature Wanderers (NW) and Canon photography shutterbugs in the tiger land. A group of super enthusiastic photographers across the country and across age groups and since over the last 2 weeks my risks were paying rich dividends I decided to ride my luck again. With over 70 vehicles expected to crowd the Mahaman area during one the evenings of the Easter weekend because of the guaranteed presence of mating couple in the Mahaman dam area, I was wondering if it was a good idea to go after this couple. The tourist pressure in the area forced me and my team to lay down a strategy of entering the Makhdee zone from a less accessed gate quite far of from the main entrance. Reports of the Blue Eyed male being sighted in the afternoon by the forest post further reinforced the decision to take the risk for if we manage to catch hold of the male it would be an exclusive sighting away from the crowd. The NW group was cooperative and agreed to jump into this plan and we all entered the forest with anxiety and anticipation. I always believe that Nature plays an equalizer and 2 weeks of positive decision making and risks that were hitting the bulls eye backfired that evening. The Blue Eyed male had walked out of the park area to the nearby village. 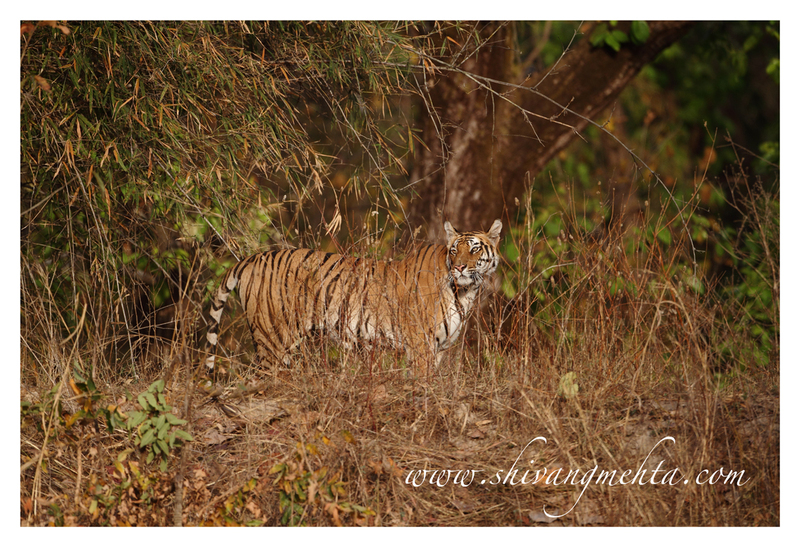 Vehicles around the Mahaman dam had a good sighting of the mating pair of tigers. However the spirits were still up because when in the wild, you need to be prepared for failures. The next morning I decided to stick to the books and since the movement was evident in the Mahaman area we entered the forest in a routine manner. Within minutes of entering the park, frantic langur alarm calls at the Charger Point attracted our attention. 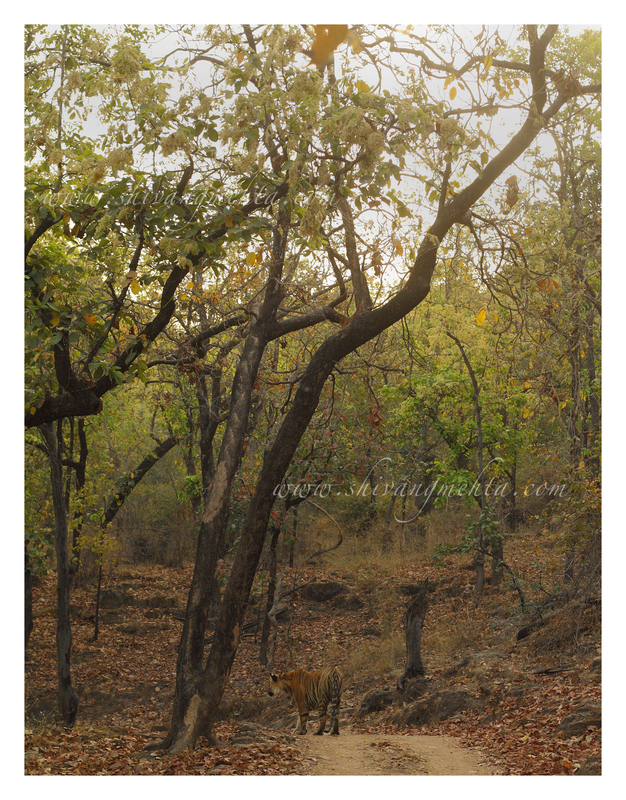 I could faintly see a male tiger in the foliage and his trajectory was towards the road. The elephant mahout who was tracking the tiger had other ideas as he blocked the male and pushed him inside the forest. During the months of March and Apr this was the 8th incident I witnessed when forest officials obstructed the movement of a tiger without any reason. As I was watching and cursing the dramatic turn of events at Charger Points a series of faint cheetal and sambhar alarm calls excited my driver. “Mahaman area sahib” he remarked. With just a exchange of glances we decided to quietly sneak off the area and rushed towards the Mahaman dam. A fully grown male and female were royally enjoying the early morning breeze. As more and more vehicles piled up at the location, the couple moved towards the foliage. I had witnessed the legendary mating of Sashi (Bamera) and Vijaya (Kankati) last year but this particular act of mating looked very different. The female seemed to be disinterested and walked off as soon as the male made advances towards her. Every few minutes the female would walk away and for around a couple of hours we hardly saw any actual round of mating. The identity of the pair was still in question. A section of the naturalist crowd present onsite felt it was Mukunda but the apparent body markings on the male were different from Mukunda (who later turned out to be the tiger blocked by the elephant early in the morning). The female was another question? 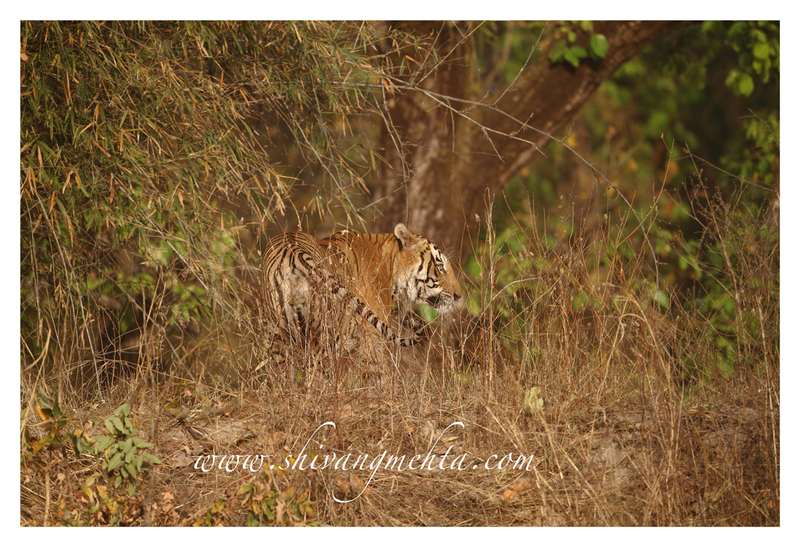 Tiger Nation reported later that the female is I9 (Indrani – last litter of Badhrashila female cubs). The male is reported to be Jobi (M9). 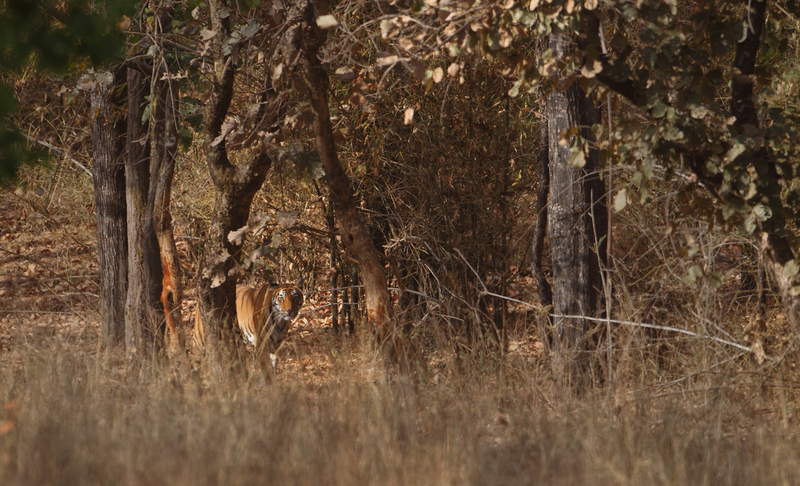 The sighting of the this couple continues to be prominent around the Mahaman area as I write this blog. Increasing tourist patrols and awareness levels definitely impacts wildlife positively. 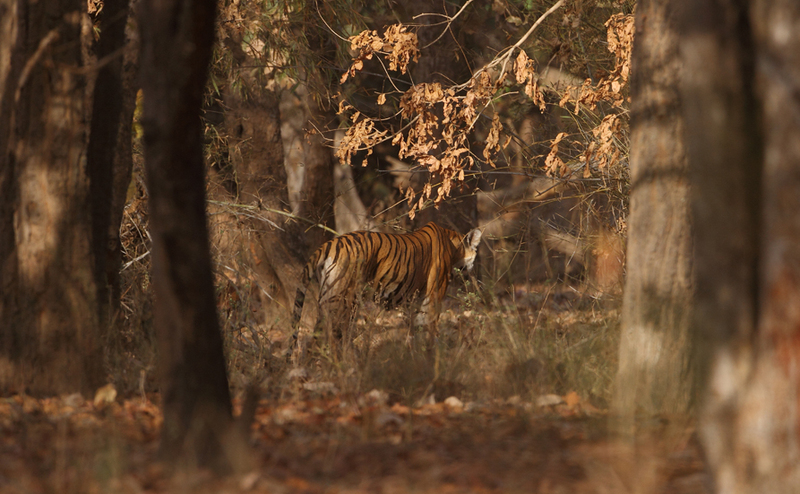 As the tiger season has progressed more and more new tiger identities have come into the limelight signaling the presence of stripes in the fringe forests of prime tiger habitats around the country.